Hello dear readers! We warmly welcome you to the sixth edition of the Samsung Galaxy Tab S troubleshooting and solutions series. We got your concerns and heard you! We always strive to give you the best solution there is for every issue you’ve encountered with your device. Hope you find these helpful. Read on! Troubleshooting: Hello Akash. Good job in isolating the issue by removing the flip cover. Did you press the power button when you attempted to put the tablet into sleep mode? There are a couple of things that may cause your tab to awaken on its own right after putting it to sleep. First, a Wi-Fi connection may have caused it. Every time your Wi-Fi loses connection, it automatically turns the screen ON even on sleep mode. Turn off the Wi-Fi function and see if it still does it. Second, this may be caused by an app you have installed in the device. Do you have any screen locking apps added? If so, remove those and make sure to uncheck all boxes for screen lock apps by going to Settings>Security>Device>Administrators. Restart the unit and check if it has been resolved. Third, make sure that the Screen Timeout feature is active and set to the desired time. You can choose between 15 seconds to 30 minutes. Try setting it to 15 seconds and see if the screen shuts and stays off. Lastly, this may have something to do with the tab’s firmware and therefore needs a reset. Let’s do a soft reset first as this can mostly resolve minor issues with the tablet. Do the soft reset by pressing the power button down for 15 seconds or until the screen shuts off. Wait for a minute or two then carefully power it back on. Try to put your tab into sleep mode and see if it still does it. If you still encounter the issue, a hard reset is required at this point. Make sure to back up all your files first. Follow the instructions on the link provided when doing the master reset. This should resolve the issue at hand. If not, bring it to a Samsung repair center for them to open the tab and replace whatever needs to be replaced inside. Don’t hesitate to reach out to us if you need further assistance. Troubleshooting: Hi Latrice. I am almost certain that this has something to do with the tab’s battery as a new charger did not help get its power back. Have you tried plugging it into a different wall outlet to make sure? Have you also tried holding the power button down for a minute and see if the tablet turns on? If you have attempted these steps but still got the issue, you may want to try resetting the battery’s connection to the motherboard. This will, however, void the device’s warranty. All you need to do is get a pry tool and use it to pry the back cover off the tablet. The process is quite tricky as you need to unclasp multiple locks before you can completely pull the cover off. Once you have opened the back, locate the battery connector at the bottom part of the motherboard. Use the pry tool to unplug the connector, wait for a minute or two, and then plug it back in. Make sure that it is firmly attached. After you have replaced the back cover, try to turn on the device. This should do the trick ninety-nine percent of the time. It would be your discretion though if you want to try this step or just send the tab right away to Samsung’s service center and take advantage of the manufacturer’s warranty. Troubleshooting: Hello Matthew. You did great in trying to identify the real cause of the issue. A hard reset is an advance troubleshooting that should be done if all else fails. What other troubleshooting steps have you tried prior to doing the master reset? On a hind note, it still got the lock button working. By the way, is your tab in a case? Sometimes the case will put too much stress on the tablet which would prohibit the home and lock button to function normally. Try to remove the case and see if it resolved the issue. Another thing that we need to consider are the applications installed in your tablet as some applications would interfere with the device’s functionality. Reboot your tablet into Safe Mode and monitor closely how it behaves. If the issue is caused by a third party app, then the device should function normally in Safe Mode, otherwise, it can be caused by a pre-installed app or a defective firmware. Another likely cause is a defective home button pad. It may not be syncing with the motherboard anymore. Since performing a master reset did not help, bringing the device to a certified Samsung service center would be recommended at this point. Troubleshooting: Hello Norman. Base on your problem statement, it seems that the tab works fine prior to putting the cover on it. There is really a high chance that the cover caused the device to go haywire. Did you make sure and check if the cover is properly seated? A bad cover placement can definitely cause any device to malfunction as it restricts its capacity to perform as needed. If the issue still persists, I would encourage replacing the cover as it may not be compatible with your tablet. Better yet, return the whole unit to the retailer and ask for a brand new replacement to make sure that you’ll get a perfectly working device this time. Troubleshooting: Hi Jim. You have a pretty weird concern there. I presume you are setting the date and time from the default clock and not from a widget? Most cases are usually caused by a bad GPS connection or incorrect time provided by the network. If you have the GPS functionality turned on when this happened, it can be affecting the date and time by basing it on what data it can get. Try to turn off GPS, manually set the date and time to the right one, and then check if it happens still. Make sure that the Automatic Date and Time feature is turned off. This can also cause the time to reset to what it thinks is the right one. Another thing to try is a soft reset on the tablet in order to refresh all the settings. Press and hold the power button until the tab shuts off. Wait for a couple of minutes then turn the device back on. Check if the date and time has corrected itself. If it still did not resolve the issue, then a hard or master reset is already required. Follow the instructions carefully and remember to save a backup as this process will completely wipe the tablet off of any data. One of the forums I came across also suggested to install ClockSync from Google Play Store as this app will help fix time and date issues. However, this app only works on rooted devices which I would not recommend for you to do as rooting your device would void its warranty. The last option is to have the tablet repaired by a certified technician on one of Samsung’s service center. Hope this helps. Troubleshooting: Hello Jeannine. Your issue is pretty common on devices that have been plugged to a power outlet with a voltage higher or lower than what is required. Even though these power outlets can hold a charge, the slight difference can still affect the device’s charging capability. It’s good to know that you have tried isolating the issue by trying out the tablet’s charger to a different device. We can now narrow the cause down to either a defective battery or a defective firmware. Since the tab doesn’t turn on anymore, we won’t be able to perform a soft or hard reset to it. Thus, the best thing we can try right now is to reset the battery’s connection to the mother board. This usually resolves power issues on tablets. You would need a pry tool for this. Once you have secured one, use it to pry open the back cover of your tab. This requires a great deal of time and patience as the back cover is attached pretty securely to the tablet. Once you have taken the cover out, locate the battery connector at the bottom part of the device. Carefully detach the connector from the mother board using the pry tool. Wait for two to three minutes before reattaching it. Make sure that it is firmly connected to the board. Replace the back cover then turn the tablet on. You should be able to load it to the home screen. Charge the device if it requires charging. Make sure to use its own charger and don’t operate it while plugged in. 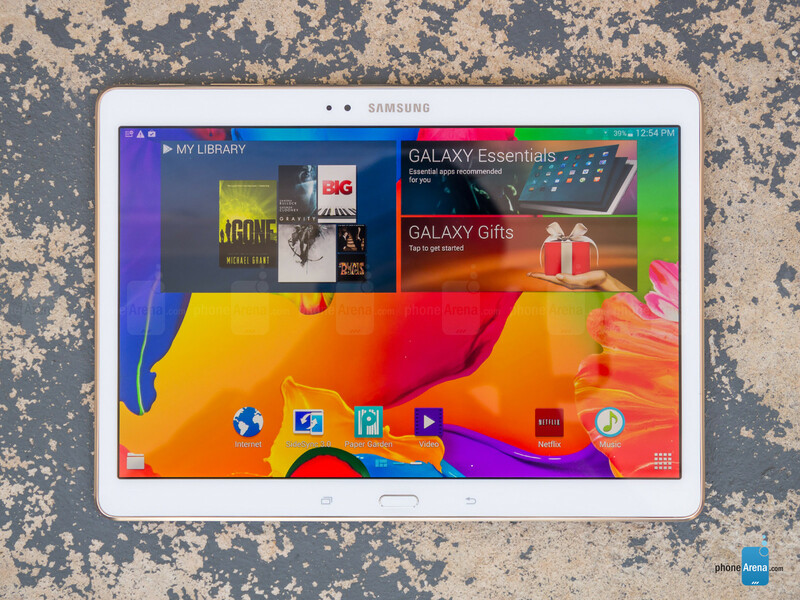 The tablet should be back to its normal state, otherwise, bring it to Samsung’s service center and get it fixed. Troubleshooting: Hi Leslie. By rebooting the tab into Safe Mode, we are determining if a third party app is causing the freezing issue. Since you mentioned that it did not help at all, then we can get rid of such probability. This may be caused by other factors such as a full cache, multiple applications are running in the background which can slow down the tablet, a corrupted content or app, and or a faulty firmware. You may want to check all the installed apps and clear its cache, stop any running apps that you don’t currently use, and uninstall any apps that you don’t need anymore. We can’t determine which app is corrupted unless we open each one, but this can be a pesky task especially if you have a lot of applications saved in the tablet. Once you have scanned all the apps, turn off the tablet by pressing and holding the power button for ten seconds. Let it rest for two minutes then power it back on. Try to play around and check if it still hangs up on you. If it does, we may be looking at a bad firmware here. The most viable solution for this is a hard or master reset. This will erase all your personal files so it’s best to save a backup copy first prior to doing this. I am almost certain that your tab will get back to normal afterwards. Just make sure that the tab doesn’t overheat as this can also make the device go haywire and freeze. Let us know if you need further assistance. Troubleshooting: Hello Ed. I would definitely agree that the Tab S has one hell of a screen — among the best, if not the best, I’ve ever seen. Though most people know that this model has some performance hiccups on its own. The Tab S is known to have some stutter and lag when jumping from one app to another or when rapidly flipping through the home screen. Some users of this specific tab claim that they see some jittery screen transitions when swiping through the desktops shortly after the tablet has started up, especially when flicking through the apps, but the jerky effect subsided after the tab had some time to warm up. Almost everyone who’s using this tablet, especially the vigilant ones, have noticed a little stutter here and there. They say this has something to do with the processor which is having a hard time catching up with the Super AMOLED display. This is pretty minor and won’t probably bother most people that’s why Samsung has not released a fix for it. Rest assured though that you are not alone and this has been creating a little fuss online. Hopefully, this fuss would be enough to get Samsung to include a fix on the next firmware update. Am very happy haven’t found a site like this,my problem with my Samsung s smt 705 tab started this afternoon .it shut down without me pressing anything I tried to on but it just wouldn’t come up ,I bought it in 2015 since I bought it I have been enjoying it not until this afternoon no was Ming nothing,I plugged it again may b it will turn up but alass still the same,pls can my tablet still come to life.thank u,anticipating ur response. My Samsung Galaxy Tab S 10.5 records videos ok.
Hi i can not do the software update on my samsung tab s. It says i dont have 942. 45mb memory space when i have 2gb. Why wont it update? I have a Samung Tab S 10.5 with 32MB purchased 9/15 and I want to use the internal GPS without being connected to WiFi in the car but 90% of the time the Google map software can’t find my location – but it did work a couple times and I believe all the GPS settings are correct. iPhone 6S always works without any problems at the same time. Any ideas? Hi, I am using Samsung Galaxy Tab S. The issue I have with the phone is that, the screen keeps on flashing on and off and this is draining the battery down so very quickly. What should I do to have the screen on sleep safe mode? I have tried many options including setting the phone back to factory resetting. hi I my had a samsung galaxy tab S SM-T705. I had updated the system just today. After the system updated it restarts and intall the updated version. After installing the new updated my wife charged the tablet , it works ok she had it charged 100%. After a while my wife notice the tablet turns off, she try to press the power and still it cant be turned on.. what should we do?